The first vacuum tube diodes were created by Thomas Edison in 1904. These initial tubes could only be used for rectification. The triode, which allowed for voltage and power amplification, was invented 3 years later in 1907 by Lee De Forest. Vacuum tubes are also referred to as thermionic tubes, thermionic valves, electron tubes, valves and just plain tubes. While, for most electronics, vacuum tubes have been replaced by transistors, there are still some uses for which vacuum tubes are desired. Vacuum tubes are frequently used in high end Hi Fi amplifiers and are generally desirable over transistors for their "warmer" tone. They are also generally preferred in guitar amplifiers both for their smoother clipping in overdrive and the warmer tone. Finally, vacuum tubes are used in high frequency communications (at frequencies that would destroy solid state components) as well as satellite and military communications due to their durability (they stand up to solar radiation better than solid state and are immune to electromagnetic pulse). Voltage Regulator: an active component which accepts a range of voltages and outputs one constant voltage. A Vacuum Tube is a container (usually of glass) from which the air is removed. Inside the tube are two or more "Elements". - Cathode: (electron emitter) has an electrically heated filament (which you can usually see glow red ) which spits out electrons that travel through the vacuum to the Anode (electron acceptor). - Anode (a.k.a. Plate): Is a conductive (usually metal) plate that is connected to a positive voltage. The negative electrons flow from the Cathode to the Anode. A vacuum tube with just Cathode and Anode elements is a DIODE. Current will flow only when the Anode has a positive voltage relative to the Cathode. - Grid(s): metal gratings or grids are placed between the Cathode and Anode to produce devices that can amplify signals. NOTE: A tube with 3 elements (one grid) is a TRIODE, with 2 grids a TETRODE, with 3 grids a PENTODE. A Grid between the cathode and anode controls the flow of electrons. By applying a negative voltage to the grid it is possible to control the flow of electrons. This is the basis of the Vacuum Tube amplifier. Vacuum tubes contain heater filaments. These are similar to the filaments one would find in a standard light bulb. The filaments usually run at low voltages (6V and 12V are common, though tubes can be found with a variety of filament voltages). The filament is surrounded by a cathode. The filaments are constructed of heat the cathode to about 800 degree Celsius, at which point the cathode begins to emit electrons. The electrons normally float on the surface of the cathode and this is called a space charge. The anode is generally kept more positive than the cathode and so it draws the electrons off of the cathode. The voltage difference in the direction from the cathode to the anode is known as the forward bias and is the normal operating mode. If the voltage applied to the Anode becomes negative relative to the Cathode, no electrons will flow. In electronics vacuum electron tube or valve is a device that controls current. Through a vacuum in sealed container. Vacuum tubes rely on thermionic emission of electrons from hot filament. The symbol for an indirect heated vacuum-tube diode. From top to bottom, the components are the anode, the cathode, and the heater filament. 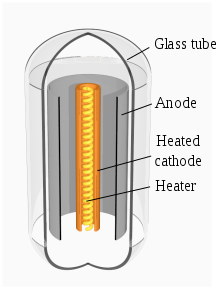 Vacuum tube diodes contain only two electrodes (besides the heater): A cathode and an anode. The filament heats up the cathode, producing a space charge. A relatively positive voltage on the anode then draws electrons from the cathode to the anode, producing the one way current of a diode. Current will not flow from anode to cathode. As with silicon diodes, vacuum tube diodes can be used for various functions. They can be used in voltage multipliers, envelope detectors, and rectifiers, for example. Common rectifier tubes are: 5AR4/GZ-34, 5V4-GA, GZ37, 5U4-G/GA/GB, 5Y3-G/GA, 5R4GYB, and 5R4-G/GY/GYA. Different rectifier tubes have different maximum voltages, current ratings and forward voltage drops. Some have 5V filaments and others 6.3V. And some draw more filament current than others. Some rectifiers are half-wave (single diode) and some are full-wave, containing a single cathode, but two anodes, one for each half of the wave, as shown in the Full-wave rectifier image to the right. Full-wave rectifier, with vacuum tube having two anodes. A klystron is a vacuum tube used for production of microwave energy. This device is related to but not the same as a magnetron. The klystron was invented after the magnetron. Klystrons work using a principle known as velocity modulation. The klystron is a long narrow vacuum tube. There is an electron gun (heater, cathode, beam former) at one end and an anode at the other. In between is a series of donut shaped resonant cavity structures positioned so that the electron beam passes through the hole. The first and last of the resonant cavities are electrically wired together. At the cathode the electron beam is relatively smooth. There are natural slight increases and decreases in the electron density of the beam. As the beam passes through the holes of the resonant cavities, any changes in the electron beam cause some changes in the resting electro magnetic (EM) field of the cavities. The EM fields of the cavities begin to oscillate. The oscillating EM field of the cavities then has an effect on the electrons passing through, either slowing down or speeding up their passage. As electrons are affected by the EM field of the first cavity they change their speed. This change in speed is called velocity modulation. By the time the electrons arrive at the last cavity there are definite groups in the beam. The groups interact strongly with the last cavity causing it to oscillate in a more pronounced way. Some of the last cavity's energy is tapped off and fed back to the first cavity to increase its oscillations. The stronger first cavity oscillations produce even stronger grouping of the electrons in the beam causing stronger oscillations in that last cavity and so on. This is positive feedback. The output microwave energy is tapped of for use in high power microwave devices such as long range primary RADAR systems. The klystron is a coherent microwave source in that it is possible to produce an output with a constant phase. This is a useful attribute when combined with signal processing to measure RADAR target attributes like Doppler shift. Related microwave vacuum tubes are the Travelling Wave Tube (TWT) and the Travelling Wave Amplifier (TWA). A Hybrid device, which combines some aspects of these devices and the klystron, is a device called a Twicetron. Magnetrons are used to produce microwaves. This is the original device used for production of microwaves and was invented during the Second World War for use in RADAR equipment. Magnetrons work using a principle known as velocity modulation. A circular chamber, containing the cathode, is surrounded by and connected to a number of resonant cavities. The walls of the chamber are the anode. The cavity dimensions determine the frequency of the output signal. A strong magnetic field is passed through the chamber, produced by a powerful magnet. The cathode is similar to most thermionic valves, except heavy, rigid construction is necessary for power levels used in most Magnetrons. Early, experimental designs used directly heated cathodes. Modern, high powered designs use a rigid, tubular cathode enclosing a heater element. Naturally excited electrons on the surface of the cathode are drawn off, into the chamber, toward the outer walls or anode. As the electrons move out, they pass through a magnetic field that produces a force perpendicular to the direction of motion and direction of the magnetic field. The faster the electrons move, the more sideways force is produced. The result is that the electrons rotate around the central cathode as they move toward the outside of the chamber. As electrons move past the entrances to the resonant cavities a disturbance is made to the electro magnetic (EM) field that is at rest in the cavities. The cavity begins to oscillate. When another electron moves past the cavities, it also interacts with the internal EM field. The motion of the electron can be slowed or sped up by the cavity field. As more electrons interact with the cavity EM fields, the internal cavity oscillations increase and the effect on the passing electrons is more pronounced. In order to have a signal output from the magnetron, one of the cavities is taped with a slot or a probe to direct energy out into a waveguide for distribution. Magnetrons for RADARs are pulsed with short duration and high current. Magnetrons for microwave ovens are driven with a continuous lower current. The magnetrons for WWII bombers, operated by the RAF, were sometimes taped into a shielded box so that the aircrew could heat their in-flight meals, hence the first microwave ovens. A cathode ray tube or CRT is a specialized vacuum tube in which images are produced when an electron beam strikes a phosphorescent surface. Television sets, computers, automated teller machines, video game machines, video cameras, monitors, oscilloscopes and radar displays all contain cathode-ray tubes. Phosphor screens using multiple beams of electrons have allowed CRTs to display millions of colors. The first cathode ray tube scanning device was invented by the German scientist Karl Ferdinand Braun in 1897. Braun introduced a CRT with a fluorescent screen, known as the cathode ray oscilloscope. The screen would emit a visible light when struck by a beam of electrons. TV tubes are basically cathode ray tubes. An electron beam is produced by an electrically-heated filament, and that beam is guided by two magnetic fields to a particular spot on the screen. The beam is moved so very quickly, that the eye can see not just one particular spot, but all the spots on the screen at once, forming a variable picture. Colours are produced by having 3 or more differently coloured screen spots activated at once to a variable degree. The 2 magnetic fields are one for the vertical deflection, one for the horizontal deflection, and they are provided to the beam by external coils. This page was last edited on 25 May 2017, at 13:56.